Blue glacé silk dress, with the moss fringe terminating the flounces and heading the top. Black moire antique polka, made en bretelle – the skirt of the basquine trimmed with a black lace, three quarters in depth. White bonnet, trimmed with short white feathers. 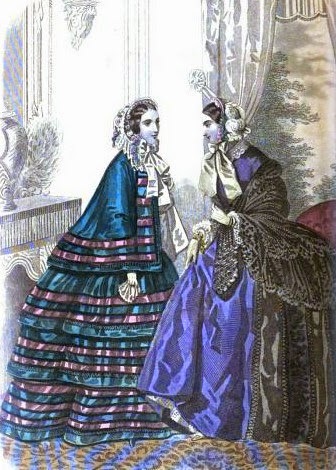 Dress of gray silk, trimmed with three flounces, ornamented with violet velvet; bretelles of the same, on the waist – which is made high, and has a deep frill round it. Undersleeves and collar of Honiton; cap composed of several rows of narrow Maltese lace, with rosettes of narrow inch wide scarlet velvet. Do you like these outfits? Would you have worn them?